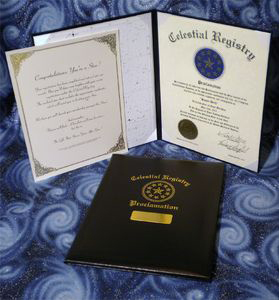 At Celestial Registry®, we offer you the gift-giving opportunity of a lifetime. Express your love or appreciation when you name a star after someone. Choose from a variety of our available star naming packages. Naming a star after someone has never been more affordable. 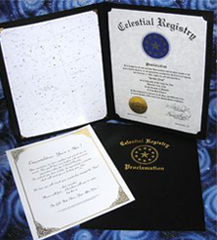 Our Economy Star Package is just $34.95 and includes our unique 8.5" x 11" certificate printed with your own special words, a 8.5" x 11" star chart with your star circled in gold, and a letter of registration These items are enclosed in a 9.5" x 12" black paper folder with the Celestial Registry Proclamation gold seal imprinted on the front. When you open the folder, the certificate is on the right hand side and the star chart is on the left hand side. The letter of registration is also included in the folder. The Standard Star Package includes the certificate printed with your expressions, a star chart with your star circled in gold, and a letter of registration for $39.95. 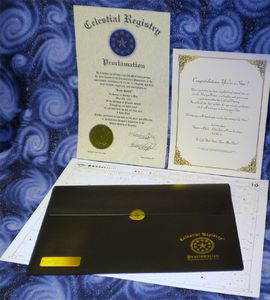 These items are enclosed in a black vinyl envelope stamped with the Celestial Registry gold seal. Add a personalized engraved plate for an additional $10. Step up to our Executive Star Package for $69.95. You'll receive a padded executive presentation folder containing the certificate printed with your own expressions. 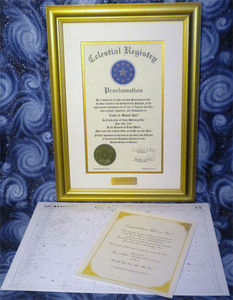 A star chart with your star circled in gold and letter of registration is also included. TheCelestial Registry Seal is impressed in gold on the front cover. The black, fully padded, leather-textured executive presentation folder is lined in white satin for upscale display. 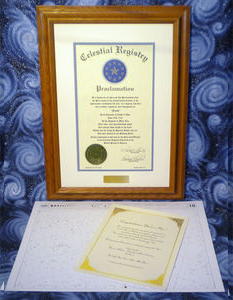 This item opens up to reveal the certificate and star chart presented with satin ribbon corners on both inside panels and can be displayed open on a shelf or desk. Add a personalized, .75" x 2.75" engraved plate for an additional $10. Show your gift recipient just how much they are loved and appreciated with an Oak Framed Star Package for just $84.95. The certificate is printed with your expressions will be presented in a beautiful oak frame accented with a beveled edge, double matting, and Plexiglas. The star chart with your star circled in gold and the letter of registration is also included. This package is available in the United States only. The attractive package is appropriate for display in all areas and will definitely leave a celestial impression! Add a personalized engraved plate for an additional $10. For the ultimate gift, choose our Gold Framed Star Package for just $89.95. The certificate printed with your own words will be framed in a beautiful gold wood frame accented with beveled edges, double matting, and Plexiglas. You receive the star chart with your star circled in gold and a letter of registration. A wonderful gift for any occasion, this package is available in the United States only. Add a personalized engraved plate for an additional $10.